While cake and doughnuts/donuts are my over-the-top treat when I crave something sweet, cookies are one of my favorite things to bake. I find them to be simple, at least in comparison to a cake. I also like how they’re easy to manipulate. Maybe one of my super powers is the ability to adjust recipes down to fit two when it’s claimed to feed an army. There’s nothing wrong with having leftovers, but after a few days, some meals just aren’t fun to continue eating and some don’t age well. They can’t all be lasagna. There are a few cookie recipes I rarely manipulate though – chocolate chip cookies is one of those recipes, same with sugar cookies. If I’m going to make those two, I’m going all in. A few years ago, when I tried the paleo diet, I tried almond flour. It’s definitely a texture I hadn’t experienced in a cookie before, but it’s a texture I enjoy. Over the past two years, I’ve been trying to figure out how to use the flour to take some of my recipes and put a spin on them. I’ve looked at other recipes to see how they deal with density and absorption of liquids because every flour reacts to liquid differently, which can result in a rock hard blob or a gooey mess. One of my biggest concerns was using Greek yogurt, but I had seen other recipes that utilized canned coconut milk or sweetened condensed milk – those weren’t really things I wanted to use. 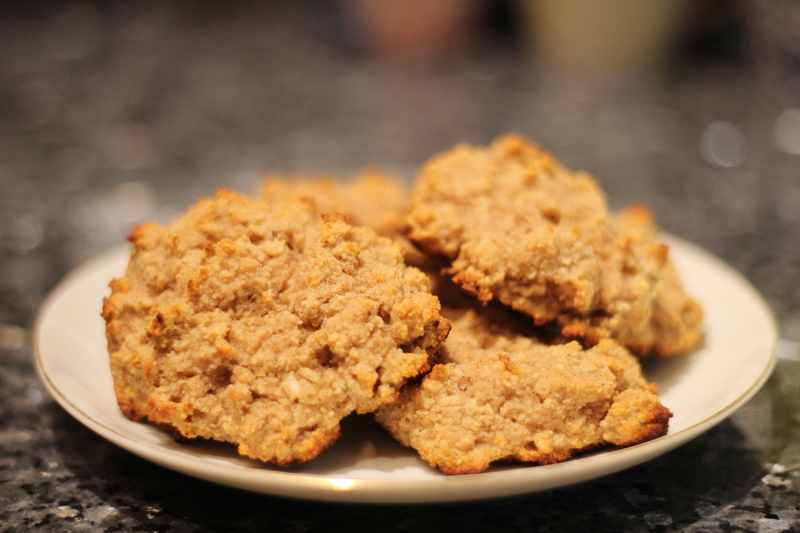 After a few months of playing around, I finally am satisfied with this oatmeal cookie recipe. 2. In a medium bowl, combine all dry ingredients until well mixed. 3. Add yogurt and maple syrup to dry ingredients. A flat spatula may work best so you can scrap the sides and get all ingredients combined well. 4. Lightly spray a baking sheet, or use a non-stick pan, place 2″ dough balls (more like piles) about 1 to 2 inches away from each other. The cookies don’t really spread out so you don’t need to worry too much about the spacing. I got 6 cookies out of this batch. 6. Remove from baking sheet and place on a cooking rack. This cookie reminds me of breakfast. I’m sure that’s weird to think about, but it reminded me of a bowl spiced oatmeal. It’s a soft and dense cookie – there’s no crunch at all. So maybe cookies for breakfast could become a thing.